The Valley Local: Painting Wethersfield Lumber Co.
One of the many nice things about this hobby is that there's always something different to do - so you can (usually) do whatever strikes your fancy. Since I'm trying to get the Wethersfield section of the layout to a level of "done-ness" as soon as possible, I decided to take a break from building Ballantine's and start on the Wethersfield Lumber Co. I introduced the model I'm using here and I did a quick mockup of this building here. And below is the only photo I have to go on . . .
Not much, eh? That's the bad news. The good news is that I can pretty much do what I want as far as finishing. As long as the shed is the pass-through type, and has a dark-ish roof and light-ish walls, I'll be ok - though I'd love it if somebody could prove me wrong with a better photo. 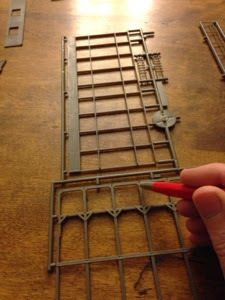 So the next step was to paint all that interior bracing/rack detail. Unfortunately, a lot of it will be hidden or otherwise difficult to see since it'll be "inside" so - taking some advice from my Thursday Night Crew - I decided not to obsess and just "rattle can" it. I did, however, decide to use my new MicroMark "distresser" to add some wood grain on the front-most parts. It went much quicker than I thought it might. 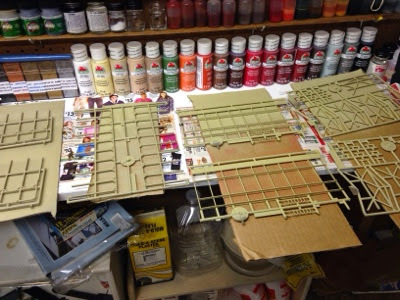 After making sure to remove any random flash, I separated the main parts for painting and headed down to the spraying room. Earlier in the day, I'd found a small can of "weathered brown" from Floquil. Unfortunately, it'd "seized up" and I couldn't get it to spray. So I removed the nozzle and used some lacquer thinner to clean it out. It still wouldn't spray. So I cleaned a little more and also used a pipecleaner to clean down inside where the nozzle goes. It was still hard to push down. So then I got what turned out to be a wonderful, awful idea - I took a bamboo skewer and pressed it down into the hole. . . .
And promptly shot "weathered brown" all over the place, including on my still-like-new black bracket light. Here's a tip: Don't use lacquer thinner to clean off a still-like-new black bracket light. It now looks like an old light with a grayish haze finish, but at least it still works. And, fortunately, so does the can of "weathered brown" spray paint. So I started spraying, and things were going pretty well - until I ran out of paint. Yup - totally empty, not just "not working." But in an amazing turn of fate & coincidence, I had just that morning gone to the store to get some new lightbulbs and other odds & ends and wandered over to the paint section - where I bought a couple of different colors of Rustoleum "camoflage" paint. 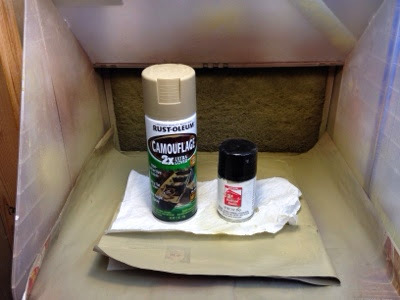 The "weathered brown" Floquil is on the right and the Rustoleum camo' is on the left. Pretty good to my eye - and will be even better with some "dusting." So that's where things stand now. I sprayed both sides of all the parts, so when everything's dry I should be able to start putting things together. D'oh!! Actually, not. I still need to do something about the walls. And, since they'll be what you see the most, I'll be taking a bit more time to do things right. And I don't think I'll be using any rattle cans - especially since it looks like that paint filled up all the nice woodgrain detail I added to the bracing/racks. Ah well, live and learn. Like I said before, this is a very varied hobby and you can always find something fun to do that suits your mood. 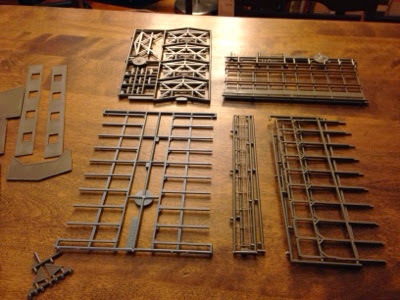 Heh - maybe I'll go back to building Ballantine's. . . . or maybe start a freight car kit . . . or work on the backdrop . . . or . . . or . . . well, you get the idea.